Above and Below the Ground tells the story of brave indigenous women activists and punk rock pastors who come together in the struggle for environmental self-determination in Myanmar’s war-torn North. A last line of defense for communities caught between coveted natural resources, military cronies, and profit-hungry multinationals, these activists fight back the best way they know how--through protest, prayer, and Karaoke music videos. Above and Below the Ground, a feature-length documentary film, is being produced collaboratively with a team of Kachin activists and videographers from northern Myanmar, including those directly impacted by the Myitsone Dam. During the pre-production process, we facilitated a 3-month practice-based series of workshops focused on music video and documentary production with rock group BLAST, environmental organization Kachin Development Networking Group, and Kachin media-makers. Workshop sections included (1) Shooting (2) Editing and (3) Storyboarding & Impact Planning. BLAST’s new album of music videos as well as Above and Below The Ground are both reflections of the training and collaboration initiated during this process. Originally from Putao, the mountainous upstream region of Kachin State, Awng Lum is a musician and pastor. When he’s not composing music or shooting music videos with his band mates, Awng Lum is spending time with his congregation in Aung Myin Tha village, a community displaced by the Myitsone dam. Emily Hong is a feminist anthropologist, filmmaker, and co-founder of Rhiza Collective and EthnoCine films. Emily has directed three collaborative non-fiction shorts, including Get By (2014), Nobel Nok Dah (2015), and For My Art (2016), which have screened in Athens, Chiang Mai, Lisbon, New York, Paris, and Yangon. The latter two draw on sensory ethnography to weave visual stories of Myanmar women refugees and performance artists, respectively. The idea for Above and Below grew out of Emily’s anthropological research in Kachin State, where she met and worked with Lu Ra, Hkawn Mai, and BLAST through year-long research on land rights and natural resources. Hkawn Mai is a 23-year old law student at Myitkyina University whose family was relocated for the construction of the Myitsone Dam. She is one of the newest members of Kachin Development Networking Group, which works to protect the natural resources and environment of Kachin State through investigative research, community trainings and mobilizing. Ja Htoi Pan is a Myitkyina native and cultural anthropologist based in Kachinland. She has studied anthropology at Dagon University in Yangon, Myanmar, Northern Illinois University in the US, and the London School of Economics, UK. Her current research focuses on social and political anthropology, material culture and media arts. She is interested in how material culture and visual representations reflect contemporary social and political change in Myanmar. Based on the China-Myanmar border, Li Li is a pastor and musician who holds degrees in divinity and music composition from Kachin Theological College and Seminary and Silliman University in the Philippines. Li Li speaks Jinghpaw, English, Burmese, Shan, and some Tagalog and Chinese. Lu Ra is one of the most active community leaders from Tanghpre village, where she helped organize brave protests that sparked an unprecedented nationwide ‘save the Irrawaddy’ campaign--a movement so successful that it led to the temporary suspension of the dam in 2011. When she’s not farming, you can often find Lu Ra organizing prayer actions, protests, and press conferences. Maggie Lemere is a filmmaker, oral historian and storytelling strategist whose work focuses on social and environmental issues. She’s been a conflict researcher, human rights trainer, refugee case worker, and filmmaker on projects across the U.S., Africa, Asia and Latin America. She’s editor of Nowhere to Be Home: Narratives from Survivors of Burma's Military Regime (McSweeney's / Voice of Witness, 2011); the book was translated to Burmese and released in Burma in 2016. Maggie is also a founder of “Storytelling for Changemakers” with Ashoka. Her short film Everyone a Changemaker: The Story of Pinelands North won the Rockefeller Foundation's international Storytelling Challenge award in 2015. 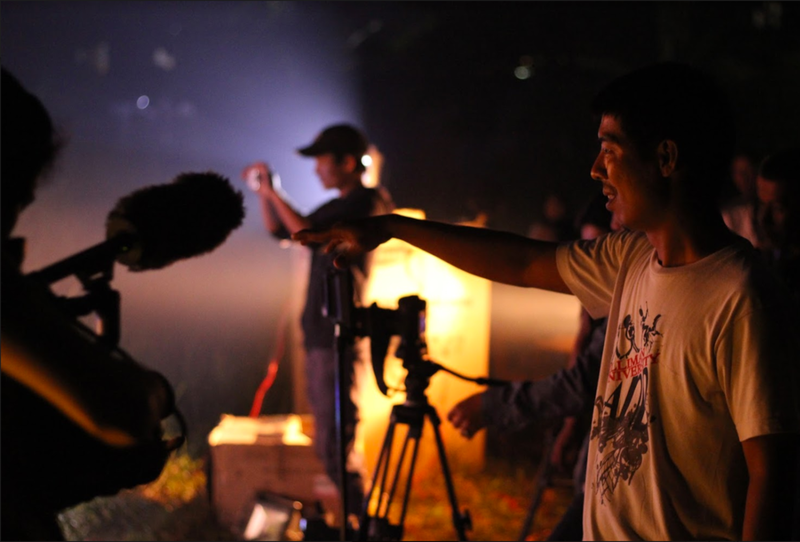 Based in Myitkyina, Kachin State, Mun is a camera operator and editor who specializes in music video production. When he’s not hanging out with BLAST, shooting and editing the music videos for their next album, he can often be found playing and recording his own music. A photographer and cinematographer based in Myitkyina, Salaw has many years of experience shooting events and music videos for the Kachin community. A long-time collaborator with BLAST, he is one of two camera operators for the band’s upcoming music video album. Originally from Myitkyina, as a child, Seng Ni hoped to be a painter and poet. He now channels this creativity as a composer and co-founder of BLAST. When he’s not composing new songs with BLAST, he works a vocal trainer for aspiring musicians in Myitkyina. Tsa Ji is originally from the Hukawng Valley, and later moved to Myitkyina because of the civil war. He is a co-founder and General Secretary of the Kachin Development Networking Group. Tsa Ji travels widely across Kachin State for social and environmental research and trainings with grassroots communities as well as around Myanmar and abroad, for advocacy on natural resource management and the intersection of environmental and political conflicts in Myanmar. Zau Mai was born in Muse Township, and grew up in Myitkyina, Kachin State, Myanmar. A graduate of the Philosophy Department at Myitkyina University, Zau Mai is interested in photography and IT security. He is now a staff member of the Kachin Development Networking Group (KDNG). Ding Ding was born in Laiza, Kachin State, Myanmar. Currently a student in the Kachinland School of Arts and Sciences (KSAS) Pre-Collegiate Diploma (PCD) program, he is preparing for further study. Zau Myit Ding’s interest in filmmaking comes from a passion to tell stories about his country in order to change it for the better. Above and Below the Ground tells the story of environmental activism in a moment of immense change, challenge, and opportunity in Myanmar. It asks how ordinary people can use the power of music and organizing to challenge entrenched interests; how the country’s first democratic government in fifty years will respond; and what this community can teach others in Myanmar and globally from their example. Kachin State is simultaneously home to the world’s most valuable jade reserves and global hotspots of biodiversity, including the mighty Irrawaddy River, and both the highest mountain and the largest lake in Southeast Asia. After decades of fighting, a ceasefire in Myanmar between the military government and the Kachin Independence Army (KIA) in 1994 led to a superficial peace and ostensible “development;” in reality, the ceasefire amounted to 17 years of crony and corporate-led pillaging of Kachin State’s natural resources, including deforestation and ravaging of mountains. While women are more than half of Myanmar’s population, Daw Aung San Suu Kyi is the only woman to hold a senior ministerial position in the country, and just 13% of elected MPs are women. Only 14% of participants in the recent Panglong Peace Conference were women, even though women have been tragically and uniquely impacted by decades of conflict. In Kachin State, as elsewhere in Myanmar, men have long dominated public life. Yet, with men’s return to the battlefield since a new outbreak of war in Kachin State in 2011, it is the women who increasingly act as community leaders in the fight for political and environmental rights. Our film shows how indigenous women activists Lu Ra, Hkawn Mai and others are testing the limits of Myanmar’s political reforms in their efforts to advance sustainable peace and development: the previous period of “peace” (17 years of ceasefire) in Kachin State was characterized by a lack of gunfire, but also by devastation of natural resources. Forests were obliterated for logging, mountains turned into mining trash piles, and river ecosystems destroyed for hydropower. Lu Ra, Hkawn Mai and the musicians they collaborate with believe that the natural resources that fuel the war are also the key to peace. Our film will highlight the emergence of indigenous women’s leadership in Myanmar and the critical need to include the perspectives of indigenous people and women in Myanmar in order to create a long-term and sustainable peace. While most policymakers think about environmental conservation, the peace process, and women’s political participation as separate policy issues, our story shows how these problems and their solutions are intimately connected. Recent openings in Myanmar present both a critical opportunity and a formidable challenge. Reports often focus on the potential of political and economic reforms in the country’s center at the expense of documenting or understanding the ongoing conflicts and injustices in the ethnic borderlands, where the military continues to abuse minority civilians. While many in the global community have felt shock at the genocidal scorched-earth campaign against the Rohingya, violence also continues with very little coverage in Kachin State, the other epicenter of Myanmar’s armed conflicts. Over 100,000 people have been displaced in the Kachin conflict since 2011. We firmly believe that we need new narratives about the continued crisis in Myanmar, with native people and women’s voices and experiences at the forefront. Created in partnership with frontline environmental defenders, Above and Below the Ground illustrates the intimate connections between ongoing war and an environmental crisis. The film focuses on a core insight of native environmental activists—the inextricable link between land rights and self-determination as the only path towards sustainable development and peace.